A term most drummers have heard but are unfamiliar with is groove. Groove is basically the swing and flow of a beat or song. If a beat has a good feel to it, it has good groove. 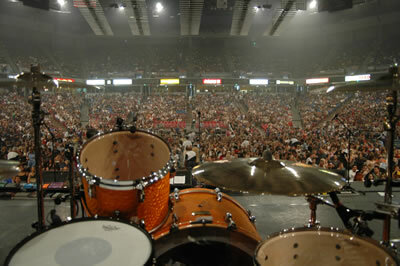 As drummers, we need to play every beat with more groove; as it will allow the song to flow a lot easier. How to play with groove is not that hard at all, it just takes practice. You may think groove is something found in funk beats or shuffle patterns, this is not true. Although the feel of this style is very “groovy”, all styles of music can have groove. So let’s learn how to start playing drums with more feeling. As most of us know, playing a basic beat can be very easy; however making that beat sound good is hard. Take the basic rock beat for example, any beginner drummer can play it, but it sounds totally different when a professional or advanced drummer plays it. This is because advanced drummers can feel the pulse of the beat and give the pattern more life. There are many ways you can do this. These techniques can be added to any beat or pattern you are playing. Here are a few techniques you can start incorporating into your playing. Before you can start grooving to any beat, you must feel the pulse of the pattern. This takes a bit of practice. Listen to the pattern and try to count the quarter notes in your head. Developing your internal clock is what every drummer needs to do. When you can feel the pulse of the song, you will be able to play around it, as well as accent certain notes and beats. This is a concept that takes time to learn. When you play a note on the drum set, you are assuming you are playing that on time. If you zoom into that note, you may be actually playing a little off to the actual click. When you are playing a pattern you can either play before the click, after the click, or on the click. All of these are ok; you just need to choose which style you are going to play. This is where it gets tough. What makes a song groove is when everything lines up, so if you decide to play right before the pulse, make sure you stick to that. Uneven hits will throw any feel off! A great way to add spice and groove to your playing is by adding in accents. This way your basic beat that you are playing will not sound so monotone. This is also known as playing with dynamics. When you can control your sticks and feet to be able change the volume on each independently, you will be able to make each beat a lot easier to listen to. With dynamic control, you can add accents to your hi hats, snare, or bass drum where ever necessary to compliment the other members of the band. Another great tip to do in order to play with more groove, is to play ghost notes. A ghost note is a soft note that is felt more than heard. So, by adding in ghost notes here and there, you will be adding feel and groove the song. Do not get carried away with this though, to many ghost notes can take away from the song. The best is to add ghost snare notes in between your hi hat hits. It almost gives the beat some texture to it. When you can feel the beat as a listener, you know you playing with groove. Try these 3 ideas in order to add more groove and feel to your everyday playing. These concepts are not something you can learn overnight. Some of these takes a lot of time to grasp; however getting familiar with these at an early stage is the best thing you can do. When you start practicing your drumming with these in mind you will be that much more accustomed to the idea of groove. Once you get the hang of this, you will start to notice a difference between a regular beat, and a beat played with groove! Keep in mind you may also need to save for drum muffling, drumsticks, and drum lessons.